This could occur if you added new features of MS Access 2007, 2010, or 2013. For instance, tables with the new multi-value or attachment field types. In those cases, you wouldn't expect to convert the database to an MDB. So you check and verify that none of your tables have these field types and you still have this problem which doesn't explain what features you're using which require the new format. It turns out this error can still occur even if you didn't add new ACCDB features. What's going on? This problem occurs if the database was opened with Microsoft Access 2010, 2013, or 2016. 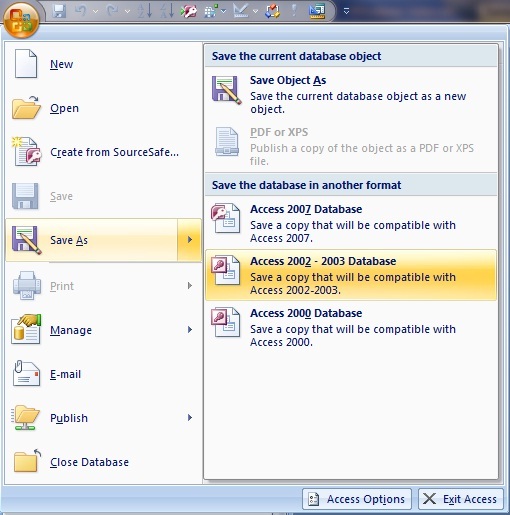 MS Access 2010 or later stores themes in an attachment field in the MsysResources table, and MDBs don't support attachment field types. So even though you didn't add this incompatible field type to your Access database, MS Access 2007 sees this table and field, and concludes the database can't be converted. It wasn't easy figuring out the cause of the problem. Fortunately, the solution is very simple. From MS Access 2007, manually delete the MsysResources table, then save the ACCDB as an MDB. If you're in MS Access 2010, 2013 or 2016, you can simply save the ACCDB as an MDB because Access 2010 or later removes the table automatically in the conversion process. Error message in Access 2007 when you try to open a table or a query in design mode in a database that is from an earlier version of Access: "The expression you entered refers to an object that is closed or doesn't exist"